Earwig is the common name for any of the insects comprising the order Dermaptera, characterized by chewing mouthparts, incomplete metamorphosis, membranous wings folded underneath short leathery forewings (tegmina), and an abdomen that extends well beyond the wings, and frequently, though not always, ends in a pair of forceps-like structures termed cerci. The order is relatively small among Insecta, with about 1800 recorded species placed into three extant suborders (and one extinct suborder). Earwigs are quite common globally, with the exception of the polar regions. Their name is tied to a mistaken belief that they will crawl into a human ear and burrow into the brain to lay their eggs. In reality, there is no evidence that they transmit disease or otherwise harm humans or other animals—despite their nickname pincher bug. Indeed earwigs provide important functions for the ecosystem and for humans. Ecologically, they consume a wide variety of plant and animal matter, including clover, other insects, ripe fruit, and garbage, while being consumed by various invertebrates and vertebrates. Members of the Hemimerina suborder feed on fungi on the skin of giant rats without harm to the rats. For humans, they can be beneficial for a garden when they prey on other insects. They may also become a nuisance because of their habit of positioning themselves within leaves and feeding on soft plant tissues, or eating the blossoms of ornamental plants. Two earwigs from Australia compared to a CF card—63 mm. Although the suborders Hemimerina and Arixeniina are comprised of species that are wingless, as are some of the large suborder Forficulina (Von Ellenrieder 2004), earwigs typically are characterized by two pairs of wings on the thorax. Of these, one pair is membranous wings and is folded in a complex manner underneath short leathery forewings. The small pair of leathery forewings is called tegmina, and they cover only the first segments of the abdomen and leave the posterior of the abdomen exposed. The small, leathery tegmina give rise to the ordinal name of the order, Dermaptera, with the name Derma meaning "skin," and ptera meaning "wings" (hence "skin wings") (Von Ellenrieder 2004). Most species of winged earwigs are capable of flight, yet earwigs rarely fly around. 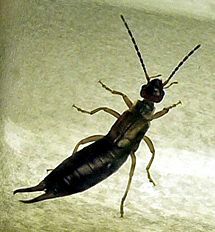 Most earwigs are elongated, flattened, and are dark brown. Lengths are mostly in the quarter- to half-inch range (10 to 14 millimeters), with the Saint Helena giant earwig reaching three inches (80 millimeters). Antennae are thin, long, and filiform (Von Ellenrieder 2004). Mouthparts are designed for chewing, as in other orthopteroid insects. Some tropical species are brightly colored. 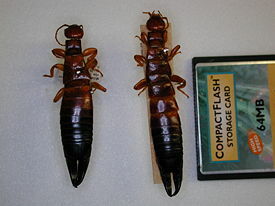 Occasionally earwigs are confused with cockroaches because of their cerci and their long antennae. The abdomen of the earwig is flexible and muscular. There typically is an unsegmented, pincer-like cerci at the posterior end, which usually is straight in females and curved or asymmetrical in males (Von Ellenrieder 2004). Cerci range from nonexistent to long arcs up to one-third as long as the rest of the body. The cerci in the suborders Hemimerina and Arixeniina is filamentous (Von Ellenrieder 2004). The flexible abdomen allows maneuvering as well as opening and closing the forceps. The forceps are used for a variety of purposes, such as opening the wings, grooming, and for defense (Von Ellenrieder 2004). In some species, the forceps have also been observed in use for holding prey and in copulation. Earwigs are found worldwide, with the exception of the polar regions; their greatest diversity is in the tropics and subtropics (Von Ellenrieder 2004). The species Forficula auricularia, the European or common earwig, is widely distributed throughout the northern hemisphere. 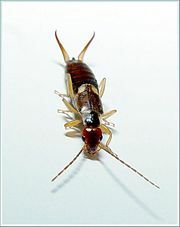 In homes, the generally nocturnal earwigs can be seen patrolling household walls and ceilings at night. Interaction with earwigs at this time results in a defensive free fall to the ground below, and the subsequent scramble to a nearby cleft or crevice. Earwigs are also drawn to damp conditions. During the summer, they can be found around sinks and in bathrooms. Earwigs tend to gather in shady cracks or openings or anywhere that they can remain concealed in daylight hours. Picnic tables, compost and waste bins, patios, lawn furniture, window frames, or anything with minute spaces (even artichoke blossoms) can potentially harbor earwigs. Upon gaining entry to the basement and living areas of the home, earwigs can easily find cover in undisturbed magazine and newspaper piles, furniture/wickerwork, base boards, carpeted stairways, pet food dishes, and even inside DVD cases and keyboards. Earwigs are exploratory creatures and are often found trapped in poison baited cups or buckets of soapy water. Earwigs are generally nocturnal, hiding in dark areas during the day and being active at night. Most species of earwigs are omnivorous, although some are mainly predacious, herbivorous, or scavengers (Von Ellenrieder 2004). Hemimerina feed on fungi and scruf growing on the skin of giant rats and Arixeniina feed on the secretions of bats and dead insects (Von Ellenrieder 2004). The common earwig feeds on other insects, plants, ripe fruit, and garbage. Plants that they feed on typically include clover, dahlias, zinnias, butterfly bush, hollyhock, lettuce, cauliflower, strawberry, sunflowers, celery, peaches, plums, grapes, potatoes, roses, seedling beans and beets, and tender grass shoots and roots; they have also been known to eat corn silk, damaging the corn. Typically they are a nuisance because of their diet, but normally do not present serious hazards to crops. Members of Forficulina generally are oviparous, while members of hemimerina and Arixeniina are viviparous (Von Ellenrieder 2004). Archidermaptera: Has a fossil record extending into the Jurassic, with fossils from that period. These have unsegmented cerci and tarsi with 4 to 5 segments. Forficulina: The largest and most familiar group. The cerci are unsegmented, and modified into large, forcep-like structures. Arixenina: Represented by two genera, Arixenia and Xeniaria. As with Hemimerina, they are blind, wingless ectoparasites with filiform segmented cerci. They are ectoparasites of various Southeast Asian bats, particularly of the genus Cheiromeles (i.e., "naked bulldog bats"). Earwig is derived from Old English ēare for "ear," and wicga for "insect." (Wicga is in turn related to wiggle, and ultimately to other words implying movement, including way and vehicle, all from PIE *wegh-.) The name comes from the old wives' tale that earwigs burrow into the brains of humans through the ear and therein lay their eggs. While earwigs are predisposed to hiding in warm humid crevices and as such one may crawl into a human ear canal, this is not a location where they are frequently found and regardless, they do not penetrate the tympanum and lay eggs in the brain (Haas 1996). Other languages have words based on the same premise: German Ohrwurm (also: Ohrkneifer, "ear pincher"), French perce-oreille, Danish ørentviste, Slovak ucholak (ucho = ear, lak = scare), and Hungarian fülbemászó ("crawler-into-the-ear"). English has derived a verb from this, to earwig, meaning "to fill someone's mind with prejudice by insinuations" or "to attempt to influence by persistent confidential argument or talk" (Random House 2006). The German word Ohrwurm has the derived meaning "an annoying tune which I can't get out of my head." Hungarian also uses the phrase fülbemászó dallam with similar meaning as the German above, although without the negative overtones. Engel, M. S., and F. Haas. 2007. [1%3AFNFED2.0.CO%3B2 Family-group names for earwigs (Dermaptera)]. American Museum Novitates 3567: 1–20. Retrieved January 3, 2009. Haas, F. 1996. Dermaptera. Tree of Life Web Project Version July 18, 1996. Retrieved January 3, 2009. Random House. 2006. Earwig. Dictionary.com. Retrieved January 3, 2009. Rankin, S. M., and J. O. Palmer. 2003. Pages 297-299 in V. H. Resh, and R. T. Cardé, eds., Encyclopedia of Insects. Academic Press. ISBN 0125869908. Taylor, J. D. 1978. The earwig: The truth about the myth. Rocky Mountain Medical Journal 75: 37–38. Von Ellenrieder, N. 2004. Dermaptera. In B. Grzimek, D. G. Kleiman, V. Geist, and M. C. McDade, Grzimek's Animal Life Encyclopedia. Detroit: Thomson-Gale. ISBN 0307394913.